Fairfield Ludlowe's Dan Stanco pitches in Fairfield Ludlowe's 4-3 win over Greenwich in the high school baseball game at Greenwich High School in Greenwich, Conn. Wednesday, April 15, 2015. After Trinity Catholic used a three-run seventh inning to beat the Greenwich High School baseball team on Tuesday, the Cardinals threatened to do the exact same thing to Fairfield Ludlowe on Wednesday. Yet the Cardinals fell a little bit short, thanks to Falcons pitcher Dan Stanco, who successfully finished what he started. Greenwich rallied for three runs in the final inning, but Stanco kept the all-important fourth run off the scoreboard and visiting Ludlowe earned a much-needed 4-3 win. A senior right-hander, Stanco struck out four while pitching out of several jams for the Falcons, who began the season with three straight losses. "We had a talk yesterday and I told him we needed him today," Ludlowe coach Mike Francese said. "We needed someone to come in and show us a lot of guts and he went all seven today and got stronger as the game went on. That's exactly what we needed." Senior third baseman Nick Warkentin went 4 for 4 with two doubles and four RBI, while first baseman Connor Daley had two hits for the Falcons (1-3). Jason Capozza, a senior catcher, went 2 for 4, including a two-run double in the seventh inning, while senior first baseman Mike Genaro sophomore Erik Mini, senior Jason Capozza, junior Kevin Woodring and junior Colin Kelly each had two hits for the Cardinals. Greenwich totaled 14 hits, but stranded numerous baserunners. "The difference in the game was the two-out hits by them compared to us," GHS coach Phil Tarantino said. "We gave ourselves an opportunity late and our team has played well. We've pitched well, we just have to work on some things offensively." Trailing 4-0 in the seventh inning, Greenwich quickly cut Ludlowe's lead. Leadoff hitter Devin McGrath singled, went to second on a wild pitch and with two outs, advanced to third on Genaro's infield single. Mini, the cleanup hitter, singled, scoring McGrath to bring GHS within 4-1. Capozza followed by lining a two-run double to left center field, making it 4-3. Showing poise in the pressure-packed situation, Stanco retired the final batter on a ground ball to second base and the Falcons picked up their first win of the season. "It eases the blow a bit because we scored a few runs in the last inning, but it still hurts," said McGrath, a senior center fielder. "We had so many opportunities, but we weren't aggressive enough early in the count and we wound up going to too many deep counts." The Cardinals put two runners on base in the opening inning behind a double from Genaro and a single from Mini, but Stanco held the Cards scoreless. In the second inning, Greenwich loaded the bases with no one out, but again, Stanco kept Greenwich at bay and his team remained ahead, 3-0. Senior shortstop Tom Ryan made one of the defensive plays of the game, making a diving catch on a looping line drive off the bat of McGrath. He then doubled up the base runner at first for an inning ending double play. "Our defense came up big today, we had some guys getting dirty out there," Francese said. "Those type of plays are what we expect from our guys. Now we have to build off this effort and take it into our next game." Stanco retired the side in order in the fifth and yielded two hits in the sixth, before the Cards rallied in the seventh. "I came into the game just looking to throw strikes," said Stanco, a right-hander. "With the wind being crazy, I knew if I could keep the ball on the ground I would be able to get outs and help us control the game. With runners on base, I tried to keep my composure by stepping off the mound to collect my thoughts." 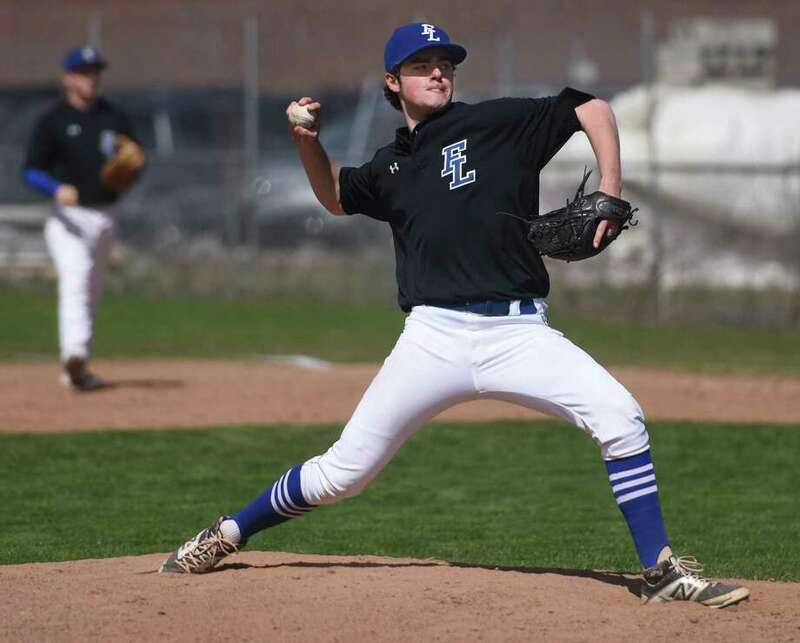 Ludlowe took a 3-0 first-inning advantage off GHS sophomore Connor Langan, who fared well in his first varsity start. Warkentin delivered a run-scoring double to right field and catcher CJ Hanrahan scored two runs with a single, putting the Falcons on top, 3-0. Langan settled in after the first inning, shutting the visitors over his next five innings of work. "I thought Connor was great for his first varsity start," said Tarantino, whose squad was edged by Trinity Catholic, 6-5, on Tuesday. "If we are going to get pitching and defensive play like that we are going to be in a lot of ballgames. We just have to do a better job of situational hitting." Warkentin's second clutch hit came when he delivered an RBI double to left center field off reliever Michael Wittner in the top of the seventh, giving the Falcons a 4-0 edge. "We had some big two-out hits," Francese said. "Getting that three-spot in the first inning got the momentum going and that fourth run in the seventh was key." Matt Strati and Anthony Ferraro and Colin Kelly each singled for the Cardinals (1-2). "Their defense was excellent and their pitcher was throwing a lot of strikes," Capozza said. "We're playing well, our offense just needs to improve a little bit." Batteries: FL -- Dan Stanco (WP, 1-0) and CJ Hanrahan; G -- Connor Langan (6 IP), Michael Wittner (1 IP) and Kevin Woodring. Highlights: L--Nick Warkentin had a pair of RBI doubles and Hanrahan had a two-run single.